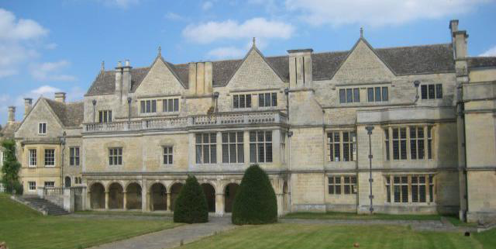 Only since 2015 has Apethorpe (pronounced Ap-thorpe) officially been referred to as a palace; the reason being that it was regularly visited and lived in by royalty, having been willed to Elizabeth I by Henry VIII and becoming a royal residence of James I and Charles I. English Heritage explained this and much more on our guided tour. As this is a private house (bought in 2014 by Baron von Pfetten) and a work in progress, we were warned not to go off the guided route – there might be no floor! To this extent we were watched over by a third English Heritage guide who acted as security. Once in the main courtyard it was immediately striking how the building was made up of different periods and styles of architecture: early Tudor on one side, Jacobean state rooms on another and Palladian on the east. These all abutted on to each other, not always cleanly; it seemed you could have been looking at three different buildings. The Tudor Great Hall was the entry point and then through an area yet to be refurbished, all the more in contrast to the rooms on the first floor. These are probably some of the most impressive Jacobean rooms in the country, with plasterwork and fireplaces intact; these included the King’s Bedchamber and next to it that of James’ friend George Villiers, Duke of Buckingham. We were informed by our guide that there had been a connecting door – and we were to infer from that what we liked! Perhaps the most impressive part of the building was the East wing, given over almost entirely to the Long Gallery, the second longest in England, only that in Hardwick Hall being greater. Under this was the 17th century main entrance, originally with a vista to the lake. We were then taken into the gardens and to an impressive restored sunken garden. The tour had taken just over two hours and there was much of the Palace that was not available to view, which gives some impression of the scale of this property. Previous page: What Do Young People Think?